I started whitewater kayaking in my mid-30s and immediately became obsessed with spending time on the river. Between my career as a domestic violence policy attorney in San Francisco and some political consulting, my obligations were significant and my weekends were short. But I almost always managed to pack up my car and my black lab Clyde on Friday evenings to head up to the Sierra foothills to float and bounce down the South Fork American River. Fortunately, I met great paddling friends who lived on the river and let me camp on their land. Those days, Clyde and I happily slept in a tent most weekends. I’d grown up backpacking with my parents, but after more than a decade of city life, spending time camping and boating started to remind me who I was. Who I am. I’d been weekend-warrior kayaking for about a year when I decided to paddle the Grand Canyon with a bunch of folks I’d never met. Many years before, having just finished 8th grade, I rafted the Colorado River through the Grand Canyon with my family. As chance would have it, we were there during the infamous high water month of June 1983. I found the Canyon and the river both magical and massive. On Day 6 we reached Horn Creek Rapid, surrounded by ancient granite and Vishnu Schist. Horn Creek has the distinction of being the shortest yet steepest rapid in the Grand Canyon and it’s often described as one of the most harrowing, especially at low water. Before floating towards the horizon line that marks the beginning of the drop, I was instructed to start center/right and aggressively move left to avoid a “must-miss” hole. I’m not sure whether it was a failure on my part to fully understand the emphasis on how “aggressively” I’d need to paddle to get left, or a failure of my somewhat river-weary body, but I didn’t make the move. Gulp. The hole tossed and turned me and eventually I came out of my boat. That’s when I did significant down time. The hydraulics of the hole sucked me deep and as all the air emptied from my lungs, I didn’t feel anxious or panicked but I had a profound sense of wanting to be free. So much so that I imagined liberating myself by unbuckling my snug life jacket. Ah, the irony – my main hope for survival was the very PFD that I contemplated taking off. Fortunately, I didn’t put these thoughts into action. I eventually popped up, gasping for air. I was through the worst of the rapid but there were still large waves to swim. Ultimately, I reunited with my boat and paddling partners and was keeping it together. But then our guide Jason said “I thought you might die in there,” and that cracked me wide open. Hearing someone else reflect on how frightening it was to wait – and wait – for me to emerge from that hole, made me feel the full impact of what I’d just experienced. In camp that evening, knowing I’d been through the near-death wringer, the two doctors on the trip offered me drugs to help me sleep. Others offered to loan me their pillows. As a first time multi-day river tripper, I had no idea you could pack a pillow! I declined the various offers and just went to bed with the sun, managing to sleep many hours and wake early. 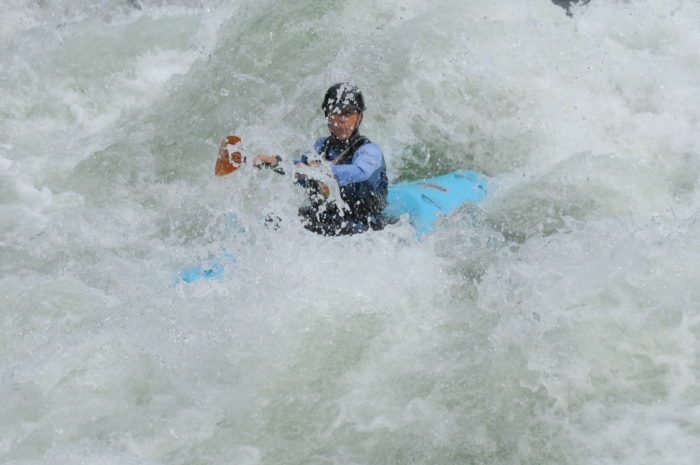 My paddling was shaky for the next few days, but I managed to stay in my boat through a lot of exciting whitewater and gradually built back some of my confidence. Then came Upset. I was unnerved by our guide’s description of Upset Rapid as requiring a move very similar to the one required in Horn Creek – pulling left through some big waves and strong current in order to avoid a (you guessed it) “must-miss” hole. Uh oh. This sounded all too familiar. I’d failed once – with somewhat dire consequences – to make that move. I trembled as we scouted the rapid. Walking along a cliff, looking at the features I’d be paddling through, I tripped and fell, bruising my chin on a sharp rock and leaving me with a shoulder injury that still rears it’s pain today. What they say in pre-trip safety meetings turns out to be true, the worst boating injuries often happen on dry land! With my newly impaired shoulder and my nerves at an all-time frenzy, I considered jumping in a raft. But I’d kayaked the full length of the Canyon so far and didn’t want to stop now. So I let the rafts pass me by. Jason led me into the rapid and motioned when we needed to put on the power. With every ounce of my energy and strength I pulled across the forceful current, successfully missing the dreaded hole in the center. But what I remember most is, having made the move, I ended up in a huge wave train. As I floated from the trough towards the crest of an enormous wave, I leaned into and speared it like a superhero. The folks who were watching from the rafts and shore erupted into cheers and told me afterwards that there was a triumphant smile on my face as I punched through wave after wave. My paddling posse knew this was a hard-won personal victory for me. I’d had to push through a lot of fear but had come through the rapid upright and exuberant. I truly believe rivers connect us. They connect us to each other and to our history and to the planet. Their beauty connects us to the sublime. Their flow connects us to infinity, something far beyond the scope of our human lives. And they connect us to ourselves. Their frothy challenges connect us to our inner power and fortitude. By their ever-changing nature, they connect us to our ability to transform. By taking us places where there are no roads and no trails, where we get to sleep under the “river of stars,” they connect us to our soul and to our spirit. For this, I want to give back to rivers. Soon after my Grand Canyon trip, I joined the Board of a river advocacy group known as SYRCL and spent seven years advocating for the magnificent Yuba River. Now I’m excited and honored to be serving as Board Chair of American Rivers. Rivers changed – and continue to change – the course of my life. Together, let’s change the future for America’s rivers.